Al-Tbahi Visam Mohamed Farhat with two of his daughters. Al-Tbahi Visam Mohamed Farhat, born in Hebron, Palestine, is fighting for his right to live and bring up his children in Nizhny Novgorod. But as this story shows, the Russian regional authorities’ decision to revoke his Russian citizenship is tied to a long-standing terrorism investigation that is more than dubious. In 2001, Al-Tbahi Visam Mohamed Farhat married Karina, a resident of Nizhny Novgorod, whom he met at a local mosque while visiting friends in the city. That same year, Visam received Russian citizenship and, together with Karina, built a family of seven children. But now, 16 years later, the Russian police have told Visam that he’s not a Russian citizen (and never was), confiscating his internal and external passports. In her response, ombudsperson Nadezha Otdelkina stated her support for the Nizhny Novgorod police. Visam appealed to the courts with a request to recognise the actions of the police as unlawful and have a new Russian passport issued. As the court established, Nizhny Novgorod police, carrying out a check on the request of the regional FSB, discovered that the documentation relating to Visam’s original 2001 citizenship application was lacking the signature of a police division chief. At the time, the division bureau nevertheless confirmed that Visam had received Russian citizenship to the district migration office “on the basis of a decision by the Main Directorate of Nizhny Novgorod Interior Ministry” — and this was signed by the chief of the passport and visa service. That is, Visam had done nothing unlawful. Rather, this was a case of negligence (if not intent) by high-ranking police officers. Moreover, Visam changed his Russian passport several times, including when he lost it 2010. On each occasion, the police failed to find reasons to refuse a new passport. 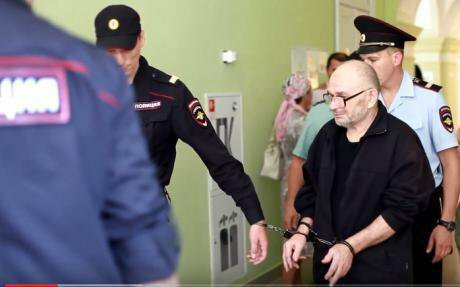 But there’s no one to blame at the police, and the authorities have demanded that Visam leave the Russian Federation on the grounds that he is not a Russian citizen. On 12 February, the city’s Sormovsky district court refused to approve Visam’s request to recognise the police actions’ towards him as unlawful. But the court did oblige Russian law enforcement to once again examine Visam’s original 2001 application for citizenship. Without waiting for the court’s decision to come into force, the police made a new application — to revoke Visam’s registration at his place of residence. Of course, there’s a question about why the regional FSB became interested in Visam’s citizenship application. And here, I would suggest, it’s important to remember that Visam acted as a defence witness in the prosecution of Tagir Khasanov, who, in 2016, was convicted of terrorism offences on the accusation of the FSB. Tagir Khasanov in court. I’ve written about Khasanov’s case in detail before, indicating facts that suggest that the case against this 70-year-old man, who died in a Saratov prison in January 2017, was fabricated. The charge against Khasanov stated that he persuaded Bagdan Umarov, a resident of Ingushetia in Russia’s North Caucasus, to smuggle himself to Syria and join “Islamic State”. Aside from the testimony of witnesses (whom, it seems, were dependent on Russian law enforcement), the prosecution also presented five cartridges, which were allegedly found in Khasanov’s apartment during a search, as evidence. Khasanov claimed that he saw these bullets for the first time when FSB officers finished their search of his apartment and removed the black plastic bag from over his head. But the investigation also presented forensic analysis that stated there were traces of Khasanov’s blood on the cartridges. Indeed, Visam gave evidence in court that explained where the defendant’s blood could have come from. Visam regularly performed hijama (blood-letting) on Khasanov, and the older man kept a jar in his bathroom, where the blood was collected. It’s hard to imagine why a 70-year-old man would need five random bullets, but the FSB’s intentions are understandable if the cartridges really were planted. The jar of blood, it seems, was needed to cement the connection between the bullets and Khasanov. Could Nizhny Novgorod’s security services commit a crime in order to secure a conviction against an innocent man? Before we answer this, remember that Nizhny Novgorod FSB shot two young men on a crowded city street in October 2016 — and two weeks later, another man in a village south of the city. The dead men, supposedly members of IS, were accused of preparing a terrorist act. A year later, the investigation was closed “in connection with the death of accused” — no evidence indicating the guilt of these men was ever presented to the public. The bodies were issued to the families for burial, although Russian federal law states that bodies of people who die as a result of anti-terrorist operations are not handed over to their families, and the place of burial is not revealed. 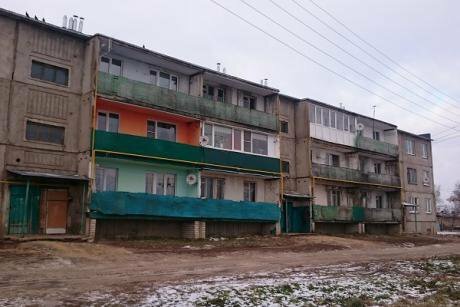 The apartment block in Yakovskoye, 200km from Nizhny Novgorod, where Tagir Khasanov allegedly persuaded migrant workers from Tajikistan to join "Islamic State". Source: Irina Slavina. But this isn’t even the most important part. The third man who was shot, as I found out later, had been living in an apartment belonging to Gulnoz Artikova, the wife of Abdurafik Artikov, a witness in the prosecution of Tagir Khasanov. This cannot be a coincidence. Marat Ashimov, legal counsel to Tagir Khasanov, believes that in Russia today believing in Islam is an “extenuating circumstance”. Under constant influence of propaganda in the media, many Russian citizens believe that being a Muslim is the same as being a terrorist. The same can be said for members of the security agencies, including their managers, who for some reason suddenly became interested Visam’s passport nearly 20 years after it was issued and right before the football World Cup (Nizhny will host six matches). 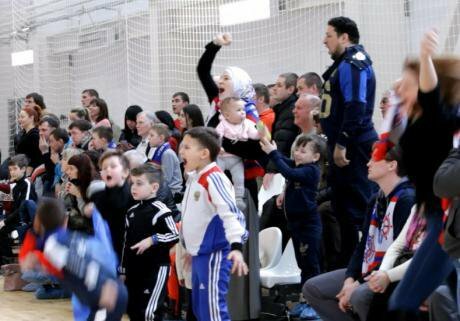 Visam, Karina and family at their son's football match. Source: Irina Slavina. Visam has suffered at the hands of the Russian security services before. In 2004, he was arrested after the Beslan massacre. According to court documents in my possession, he was suspected of involvement in the Hizb ut-Tahrir organisation, which was banned in Russia in 2003. Visam was held in detention for eight months, as the security services tried to get him to confess (including via illegal methods). In effect, the security services had both a pretext and the opportunity to check if Visam had acquired citizenship illegally. It seems this issue wasn’t relevant then. Despite being tortured, Visam did not incriminate himself in 2004, and the investigation turned up no evidence against him. He was eventually released, though he didn’t wish to apply for rehabilitation or compensation — understandably, he didn’t believe in the possibility of justice. All his energy was directed at his son and wife. This incident took a tragic toll on the family: Karina lost two children during pregnancy. Later, they gained three sons and three daughters — Karina, as she tells me, had always dreamed of having many children. According to Karina, people have really changed in recent years, they’ve become more angry. 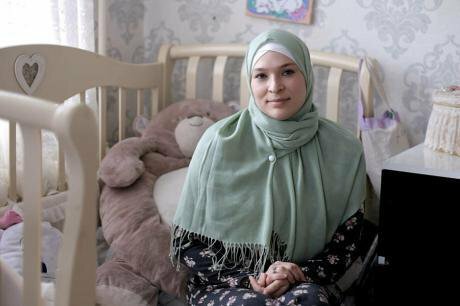 Once, she remembers, a woman saw her wearing hijab and called her a shakidka, or terrorist. Karina blames the media for this. Visam views the situation optimistically, and says that despite what happens, everything is for the best. For Nizhny Novgorod, the population of which is falling by the year, this means that the city could lose a large, successful family. Their sons are actively involved in sport: Bassam, the middle one, is the captain of his sports team; and in their apartment, the children’s room is full of sports medals and certificates. Meanwhile, after the authorities have built a 45,000-seater stadium for the football World Cup, they don’t know what to do with it afterwards — the old stadium, with 18,000, was rarely full. 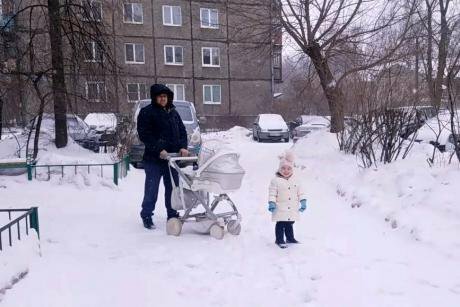 These parents and their children are the pride of Nizhny Novgorod, at least that’s what some city residents are saying on Facebook. But while we wait for the decision of the appeal court, it seems that Russian law enforcement has its own idea of what the city needs.